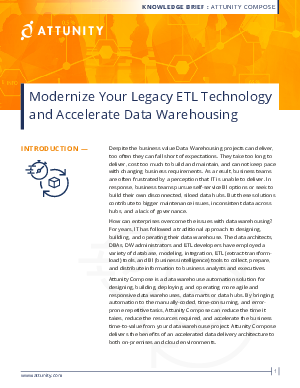 How can enterprises overcome the issues that come with traditional data warehousing? Despite the business value that data warehouses can deliver, too often they fall short of expectations. They take too long to deliver, cost too much to build and maintain, and cannot keep pace with changing business requirements. If this all rings a bell, check out Attunity’s knowledge brief on data warehouse automation with Attunity Compose. The solution automates the design, build, and deployment of data warehouses, data marts and data hubs, enabling more agile and responsive operation. The automation reduces time-consuming manual coding, and error-prone repetitive tasks. Read the knowledge brief to learn more about your options.